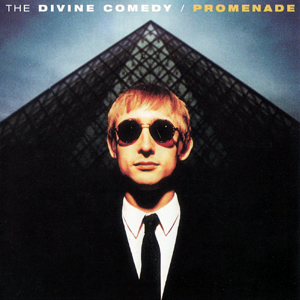 Probably the most significant Divine Comedy album, Promenade is the album that deserves the most a listen among its discography. One of the amazing things is how young Neil was when he composed this masterpiece. He started writing most of the songs in ’92-’93, though he only recorded them after the release of Liberation. It was actually recorded around December 1993 and released in February 1994. As usual, or maybe more than usual, the album is full of references to many forms of art: music (Michael Nyman, Schubert), literature (Shakespeare, Browning, Hughes, Descartes and of course all the ‘Booklovers’), cinema (Jeanne Moreau, Jean-Paul Belmondo, Jean Seberg, Sir Laurence Olivier, Audrey Hepburn, etc... with references to several films as well), religion (see ‘Bath’ and ‘A Seafood Song’), painting (Botticelli). Talking of visual art, the sleeve’s pictures were taken in Paris, by the Louvre and the Pyramid. The classicism of the museum and of Paris give the album the flavour of old times, yet on the other hand, the clash with the very modern Pyramid also creates a sense of atemporality, and as such eternity. The greatness of the album lies in its contents though. More than a mere album, it’s a concept album, almost a novel actually, in which each song would be a chapter. It’s the story of the day (December 31st 1999) of a British couple. Though the narrative standpoint changes in each song, there’s still a permanent thread. The story starts with heroin (compared to Aphrodite and Ophelia) having a bath in the morning before leaving (cf: ‘Bath’). Then we shift to the hero, riding his bike to meet the heroin down the hill (cf: ‘Going Downhill Fast’). Then comes what in a film would be the credits at the start. Of course, here they are not credits. The song ‘The Booklovers’ seems to be here to settle the theme of the album: the quest for happiness. Then we get into the story itself: the hero and the heroin lunch of seafood (cf: ‘A Seafood Song’); it starts raining and they have to find shelter in an uninhabited house (cf: ‘Geronimo’); then they go to the fun-fair and ride the Ferris wheel (cf: ‘Don’t Look Down’); they go to the movies (cf: ‘When The Light Go Out All Over Europe’); after that they return to the place where they used to spend the summer holidays when kids (cf: ‘The Summerhouse’); they have dinner with some guest, she plays a bit of piano and, bored, drowns herself, but he rescues her (cf: ‘Neptune’s Daughter’); the guest celebrate it (cf: ‘A Drinking Song’); it’s getting close to midnight and they muse on their past (cf: ‘Ten Seconds To Midnight’); during the final flight (‘Tonight We Fly’) at the edge of the New Year, the couple look back at their life from begining to end. Then, we have the credits again, in the sample at the end of the album. It’s an echo to the chorus of ‘The Booklovers’. It’s actually an extract from Horace’s |i]Ode To The Man[/i] which Neil got from the film with Sir Laurence Olivier, Tom Jones: «Happy the man, and happy he alone,/He who can call today his own./He who secure within can say:/“Tomorrow do thy worst, for I have lived today.”» Thus the chorus in ‘The Booklovers’ and the sample at the end frame the story. Song n°1: settles the theme of the album. ‘Bath’ is in itself a short summary of the story narrated throughout the album. Song n°2: also settles the theme. In Promenade, it’s a just a shift from one character to the other. Song n°3: the story can start. Here it corresponds, as said earlier, to the credits of a film. Then the story develops and we reach the end. Song n°12 (last or one-before-last): it marks the beginning of something new (they have reach happiness). It’s the real end of the story. Track n°13: Credits. The album closes as it opened: on the theme of the quest of happiness, but this time the characters have found it.